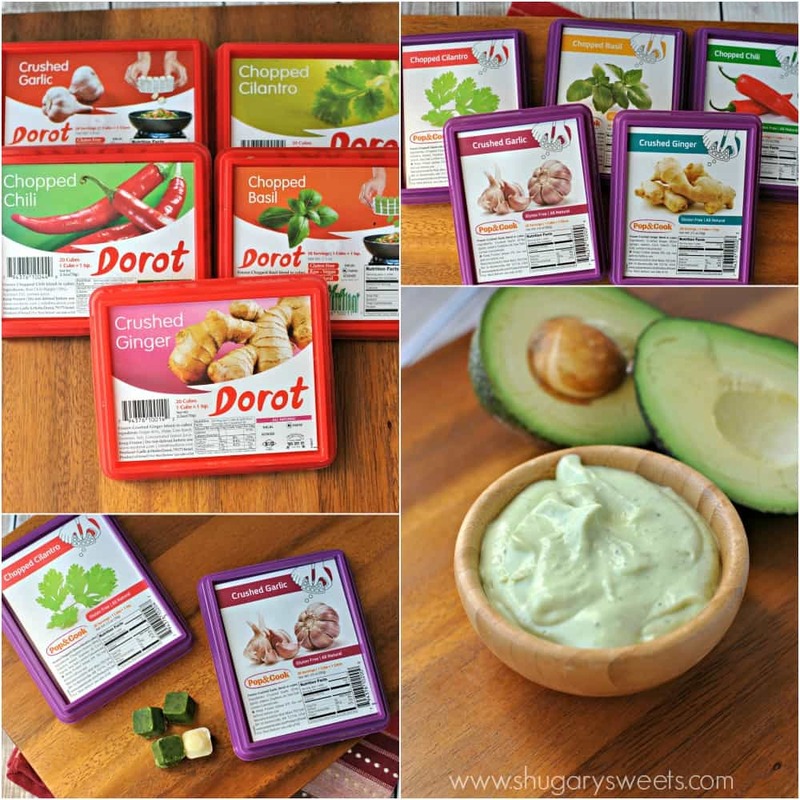 **Thanks to Dorot and Pop & Cook for the delicious garlic and herbs for this post! While I know many people change their eating habits this time of year to include more salad, we love salad for dinner YEAR ROUND. By adding in some protein, it’s the perfect healthy meal! Cooking up some extra chicken early in the week, or using a rotisserie chicken from the grocery store makes assembling this salad even easier. And the dressing? OMG you guys it’s delicious! I may have spooned a little extra on this salad! But it’s okay, because this is a healthy dressing! I’ve seen people on facebook complaining that Greek yogurt is such a fad and it’s disgusting. WHAT?? I’m such a Greek Yogurt lover. I love adding it in place of sour cream or mayonnaise. It’s healthy, packed with protein, and delicious too! I’m also a huge fan of using fresh herbs. But, living in the midwest my garden is completely iced over this time of year. Fortunately, I can buy frozen herbs from the grocery store and keep them in my freezer at all times! At Walmart, you can find the purple packages under the name of Pop & Cook, and elsewhere they are in red packages and go by the name Dorot. Keep your eye out in the grocers’ freezer section at your local stores! My husband also found the Dorot Crushed Garlic at Costco, so keep your eye out!! You may remember last year I made this Turkey Noodle Soup and this Gingerbread biscotti using Dorot/Pop & Cook garlic and herbs!! I absolutely love them. Today’s dressing uses the crushed garlic and cilantro! 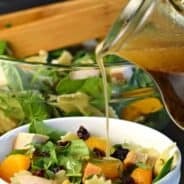 You won’t even know they came from the freezer, the taste of this salad dressing is incredibly fresh! Arrange salad in 4 salad bowls. For the dressing, in a food processor, add avocado, lemon juice and greek yogurt. Process for about 3 minutes until smooth. Add in remaining ingredients and process an additional 3 minutes. 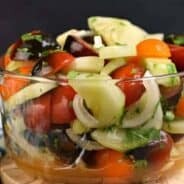 Serve with salad and enjoy! MMMmm, Southwest Salads are one of my favorites! 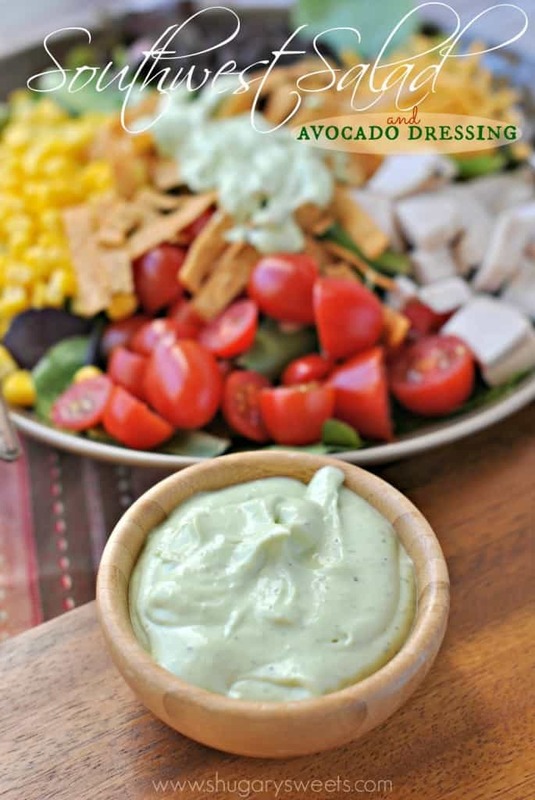 The avocado dressing looks perfect….I bet the Greek yogurt addition makes it so thick and creamy. Man, now I want salad for breakfast. Maybe that’s weird, but I’m over it. I have to admit that we don’t have as many salads as we should at our house. 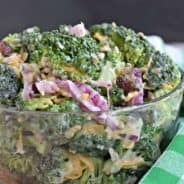 I’ve been trying to add a side salad to our dinners for the past week. Love the idea of this dressing. I’m definitely going to try it next time I make a shopping trip. Let me know if you try it!! It’s so creamy and delish!! That dressing looks and sounds fantastic! And the frozen herbs…what a convenience! I always buy a bunch of fresh cilantro and just end up using a few sprigs. This seems like a great alternative! Cilantro never lasts at our house! If you can find the frozen herbs give them a try!!! I am such a Greek yogurt addict! And avocados disappear when I’m around. Healthy Mexican? Hello happiness! 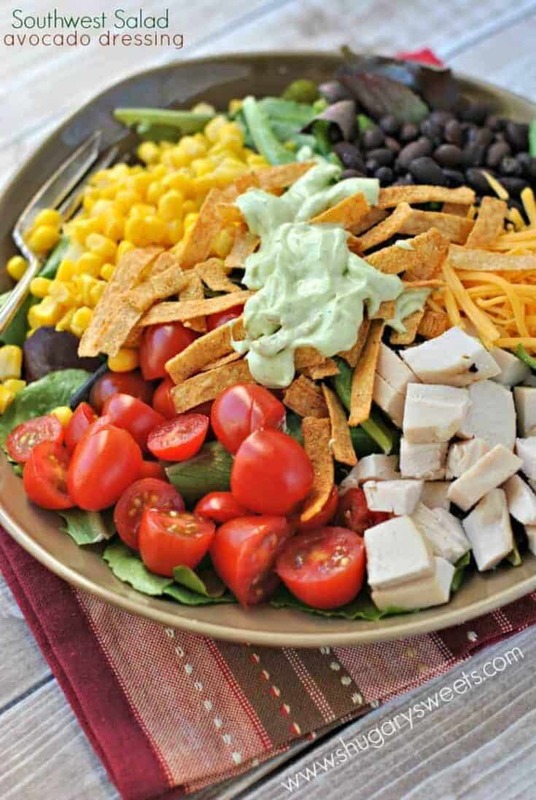 I love all the colors and textures in this salad! 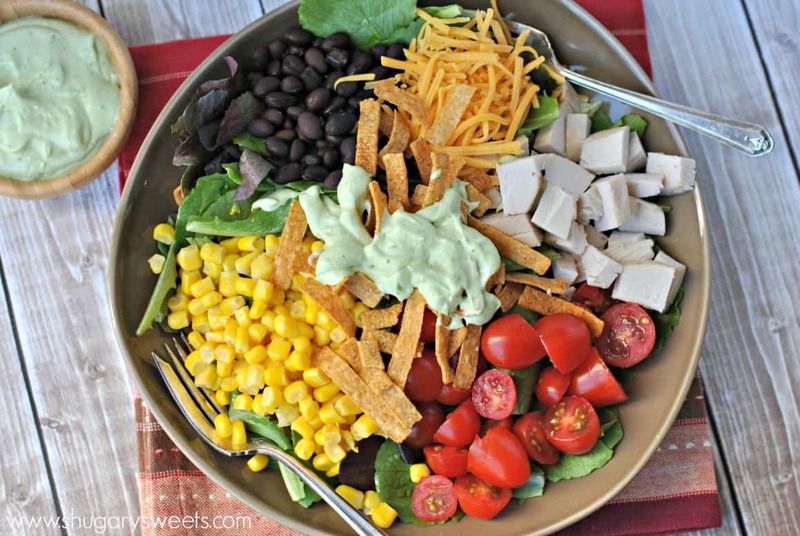 I haven’t been enjoying salads nearly enough but I’m totally craving this one! I love using greek yogurt in the place of other things. This dressing looks to die for. Yum. With the heatwave we are having here in Australia at the moment we are living on salads! Love the idea of adding tortilla strips to a salad and can’t wait to try the dressing! What a beautiful salad! I have seen these frozen herbs and garlic at the store but never tried them. Since I also live in the Midwest this is a great option. This looks amazingly delicious – especially the dressing! I love Greek yogurt and have been using it for all kind of new things lately, like salad dressing and dips – such a great alternative to mayo. I am not a huge dressing fan but oh this sounds amazing. And that salad! Sign me right up. I love Dorot! Makes things so easy! And avocado is always a favorite! Yum! I love Dorot too! So awesome to keep them on hand in the freezer! Wow, this salad looks awesome! So colorful. 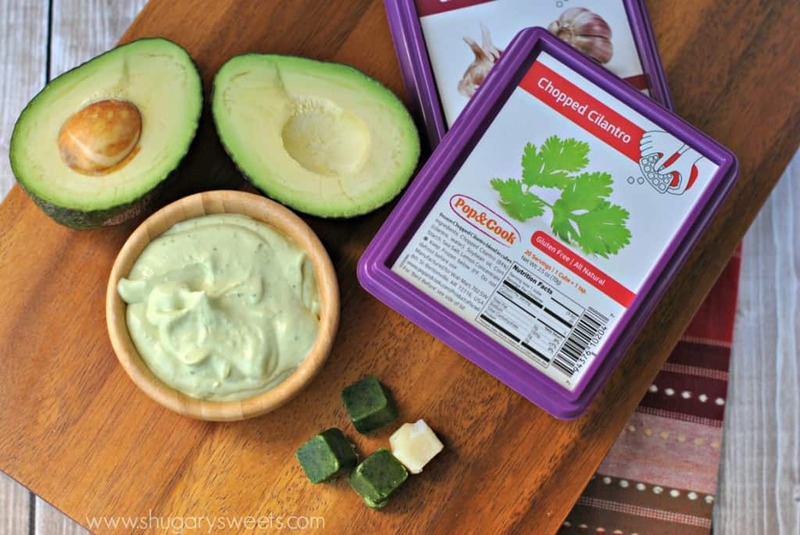 And that avocado dressing…. ahh. Amazing. South west flavors are my favorites! I love it in this awesome colorful salad!!! And avocado dressing? I am in love!!! 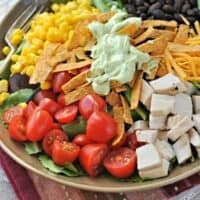 This salad looks amazing, packed with flavor! And the avocado dressing…drooling over here! Quick and possibly dumb question – for the Dorot, do you need to microwave them first before mixing for the dip, or do you just go straight from freezer to mixer? I was wondering what the ratio would be for the garlic and cilantro if not using cubes? I cant get them where I live so I’d have to use the real thing. Thanks in advance. Great your site.When i view your article and view your site have good.I like your site.I have feel good in your content the best.thanks for this nice information.